To be sure, I agree with the author that we must keep the focus off ourselves and on God. This very conviction is why I was surprised to see that the author chose to skip over the rich opportunity to discuss the gospel truths about God displayed in these two verses and instead discuss how what God offers us (which he would define differently from Christians by using the Great Controversy paradigm) should change us. Let’s take a look at the rich truth of God found in verse one alone! This will be far more meaningful if you are willing to take the time to look up the referenced passages in each section. Let’s stop there. This church is in God through the work of the indwelling Holy Spirit who has caused them to be born again and placed them IN Christ ( Eph 1:13-14, Col 1:13,14, 1 Peter 1:3). When we are born again, we are adopted children of God and heirs of eternal life which is kept for us by the power of God-- not by our works (John 1:12,13; Romans 8:15-17; 1 Peter 1: 4, 5; Eph. 1:13,14). We will never be cast out of the family and we can know we are saved from death and have eternal life the moment we believe. We can know this with the same assurance we have that God is God (John 6:37; John 17:11,12; 1 John 5:13)! Lordship is about Jesus’ sovereign reign over our lives-- yes, even over our “free will” (Daniel 2:21; Romans 9:20-23) . To call Jesus Lord is to truly bow the knee to Him as our King. It means giving up our self-given “right” to understand Him, or approve of His ways, and choosing to submit to Him even when His ways do not make sense to us (Rev 6:10). The name “Jesus Christ” holds powerful and deeply moving theology! This name tells the Christmas story and the gospel testimony of God in just two words! I pray that you will spend time with this, because it also deals with the issue raised by the author at the end of the study. This child was Elohim! All three persons of the Trinity! Jesus was God in the flesh! “In the beginning Elohim created the Heaven’s and the Earth...” (Gen. 1:1). “In the beginning was the word...and the word was God...All things were made through Him...” (John 1:1, 3). “The word became flesh and dwelt among us” (John 1:14). He was perfect, without sin because He was the “exact imprint” of the very nature of God (Hebrews 1:3). Jesus, the God-man, was the Christ-- the Messiah. He came to be a propitiation for our sins so that we might be saved by faith in Him and by His righteousness-- not ours (Romans 3:23-35). God came on a rescue mission for us! There is so much more to these two verses than the grace and peace discussed by the author, however if you wanted to summarize all of this rich theology into the grace and peace of God, even then the author misses the point entirely. God’s grace is His unmerited favor. To know God’s grace one must intimately know that there is nothing we can do to earn His favor, His salvation (even “Sabbath-keeping”). Experiencing God’s grace is to experience our salvation. It is to experience knowledge of our own depravity and to experience His unmerited search and rescue into our lives. The grace the gospel gives us is the deep knowing of having been adopted and planted in His kingdom of light on this side of eternity (Romans 8:28; Col 1:13,14). God’s most beautiful picture of grace is our salvation, and the gift of the assurance of His finished work with all the blessing that comes from that fountainhead of truth. When we finally grasp the reality of God’s grace, we can finally see that the day we attend church, or the day we buy or sell goods, has no baring on our salvation! Our salvation is unmerited. To understand God’s grace, is to throw an atom bomb in the middle of Adventist theology. God’s peace is not simply a settled mind and body. It is a provision for the soul even in the midst of great turmoil and heart ache. It is the Holy Spirit ministering life to us in the middle of great trial. God’s peace is not merely tranquility that comes from “knowing” something to be true as the author suggests. It is a supernatural provision, it is unmerited, and it is something that is felt even among the least educated or most handicapped. God’s peace is not limited by our understanding theology or spiritual disciplines. It is a gift and we cannot produce it through our personal education or spiritual comprehension. When we understand all the theology involved in verses 1 and 2, the question of how we make these “hopes and promises” our own becomes a non-question. If this letter is written to those who are in God, than the “hope and promise” is our reality—they are already ours. Later in the lesson the author writes, “There are people who feel close to Jesus yet are afraid of God the Father.” This is especially true within churches with a false understanding of the Trinity. Adventism, having it’s roots in anti-trinitarian beliefs and a false understanding of who Jesus is, has created a very different God from the one of scripture. 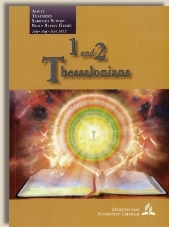 Adventism has created a tri-theistic godhead, though they will use the term Trinity in current teaching. This change in language has not changed their story (the Great Controversy) of a god and a Jesus each having bodies before the incarnation and a Jesus being elevated to the position of the godhead. As mentioned earlier, it was Isaiah 9:6 that opened my eyes to the reality of Who Jesus is. Jesus is Elohim in the flesh. When we understand the truth about God, the truth about Elohim, the truth about the Trinity, then there is no reason to fear the Father! A reaction to God like that, reveals a wrong understanding of God.